In the middle of the Mediterranean Sea, about a hundred kilometers to the south of Sicily there is a small state called Malta. It includes a few islands, the largest of which are Malta and Gozo. The latter is three times smaller than the Malta island. Usually, when Malta is mentioned the first thing that comes to mind is the Maltese cross and the Maltese order of nights. Other sights of Malta are much less known. Among them there are some prehistoric temples of Malta, the oldest of which are considered to be more ancient than the Egyptian pyramids. 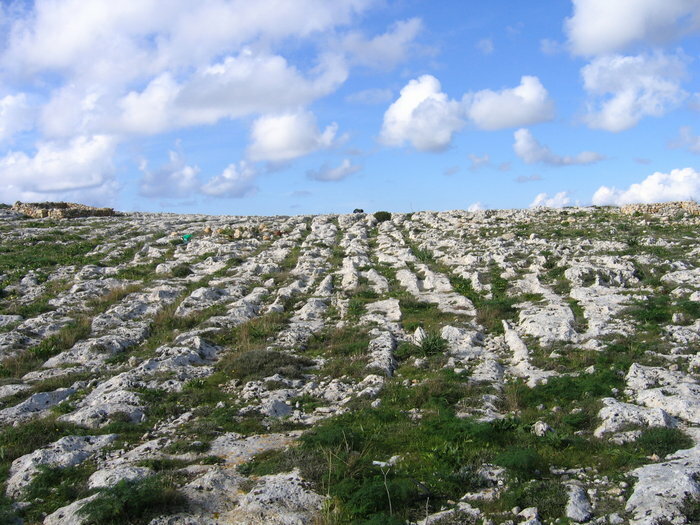 Very few people heard of a mysterious phenomenon: the pairs of ruts in hard limestone occurring here and there on these islands. Because of the external resemblance to tracks or traces usually left by carts they have received the name of “Cart-ruts”. In spite of the fact that people see these traces, live near to them and walk by them for thousands of years, there is no standard answer to the question of their origin. This article is a brave attempt to solve this mystery as well as to reveal some secrets of temple builders. However before I get to the main topic I would like to make a small deviation and to explain how it happened, that I, an inhabitant of Saint Petersburg, the city which is very far from Malta got interested in the problems of Maltese prehistoric temples and cart-ruts. sea and East Siberian sea where I could see what the hollows were filled with and how they have been developing. Thousands of meters of drill core have passed through my hands, and I could get a general picture of the character, origin and evolutions of deposits being laid in those places with severe climate in recent time. Toward the end of my geological career I was lucky to visit the Franz Josef Land for a couple of times and to participate in drawing up of a geological map of that place. In the process of thinking through all the data that I have accumulated for these years I was becoming more and more convinced that the process of mountain building, or at least initialization of mountain building in these different and removed as far as thousands of kilometers from each other areas, has taken place quite recently, only a few thousand years ago. Such wide extent of this process could only point to its worldwide character. Having assumed this I asked myself a question: if initialization of mountain building has taken place just recently there should be some traces of it in the history of mankind. In fact this process must have resulted in changing a coastal line, character of landscapes and the climate, i.e. all of that which very strongly influences life of people and consequently must have been reflected in people’s activity. Indirectly, this hypothesis is supported by some drastic qualitative changes which took place in the history of mankind about five thousand years ago. These changes are well known but not explained till now. That is when a fast leap in development of human race took place. It was then that the first centers of civilization, some early states as well as writing skills first appeared. It was the beginning of so-called «historical time». The second important evidence of some worldwide catastrophe is the legends of the Flood, which circulate in a number of different nations occupying different continents. In order to check this version I decided to visit places where most mysterious, prehistoric, constructions were concentrated. I wanted to try to apply to them the system of my views in order to reconstruct the ancient relief and then from this point of view to look at traces of the activity of ancient people. I could go to France to look at megaliths in Carnac or to England to look at dolmens but it turned out that getting a visa for a Christmas vacation to Malta was the fastest. So it happened that my assumption has been tested on cart-ruts and temples. The results of my research have only strengthened my belief that the chosen way was right. So, we shall start. The first thing that we will examine is so-called traces of carts (Cart-ruts). I believe that it is better to see something once than to hear about it a hundred times. 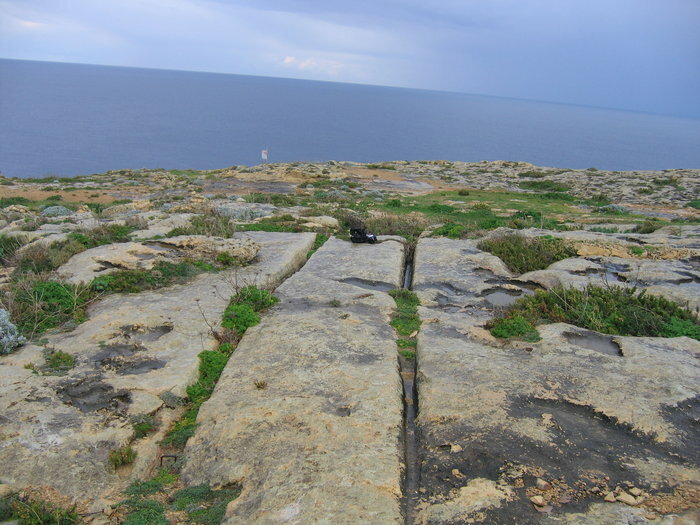 Therefore I will support the results of my research with some photos of cart-ruts taken in different places of Malta and Gozo. Photo 8 - Malta island, the shore of the bay St. Georg. The photo taken by Daniel Cilia, published in the book by D.H.Trump “Malta. Prehistory and Temples”. 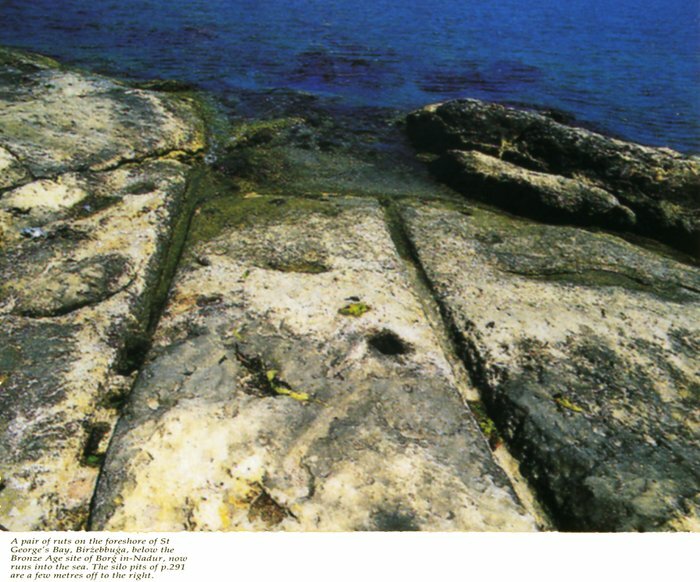 Photo 9 - Malta island, the site Ghar Zerrieq. The photo taken by Daniel Cilia published in the book by D.H.Trump “Malta. Prehistory and Temples”. Photo 10 - Malta island. he site Clapham Junction. The photo taken by Daniel Cilia published in the book by D.H.Trump “Malta. Prehistory and Temples”. Here I have intentionally presented the cart-ruts which differ among themselves as much as possible. For a fuller picture of the cart-ruts, I think, I should add the following data. The maximal depth of ruts reaches 0.7 meters, on the average it is 0.2-0.4 meters. The width of a separate rut varies from 10 to 30-40 centimeters, on the average it is 15-20 centimeters. The cross-section structure of ruts is sometimes exactly U-shaped (Photo 1), but more often it is V-shaped (Photo 5). The length within the limits of the revealed sites is a few dozens meters, more seldom it is a couple hundred meters. The distance between the axes of ruts varies from 1.35 meters to 1.55 meters according to my calculations. On the average this distance is 1.41 meters, which is based on the results of numerous measuring. There is no connection between the orientation of cart-ruts to cardinal points or to the certain elements of the relief. 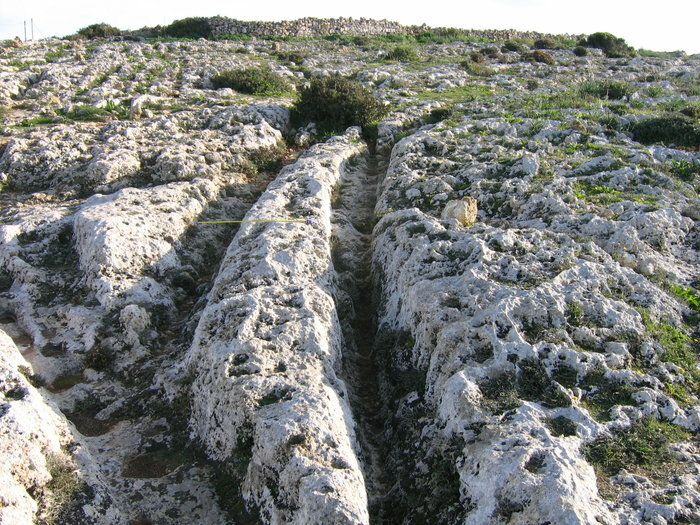 The cart-ruts can be found both on the tops of the hills and on slopes on the whole range of heights: from 1-2 meters below the sea level (on the coast of St. George’s Bay, where they are covered with water (Photo 8)), up to the height of + 253 meters in the area of Dingli cliff. 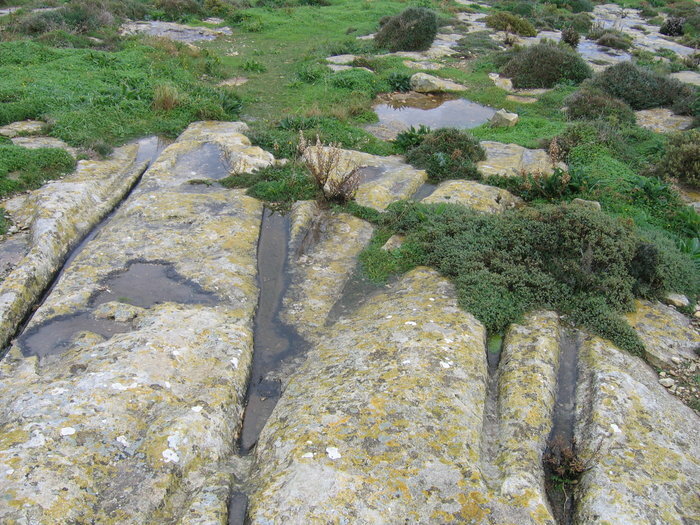 However one can notice some connection with certain geological formations: almost everywhere the ruts appear on the fields of the distribution of so-called "coralline limestone” marked on maps by the local geological service. Cart-ruts can be found both as single ruts and as groups of ruts. In relation to each other the pairs of ruts can move closer to each other, go in parallel to each other (Photo 3) or cross each other under acute (Photo 2) and right angle (Photo 10). Very frequently cart-ruts can vanish and then appear again in some distance. A site called «Clapham Junction» located on the Malta Island, near Dingli Сliffs is especially interesting and illustrative. There are tens of cart-ruts pulled together on the area of 2-3 hectares (see Photo 3 and Photo 10). It reminds a major railways cross sections where several tracks are coming together. It seems as if those cart-ruts came from nowhere and then vanished into nowhere again. At the first glance at this particular site of cart-ruts one can see that hey are of poorer quality than usual. They more often disappear on their way and they are less contrasting against the background of mixed and uneven micro relief of the surface of limestone. They can be seen much better from the air. Aerial photographs of this territory are most stunning and puzzling. Only here it is possible to see the ruts of different scale − the main and ordinary ones. The first ones are characterized by greater contrast, depth and width and are very similar to rural tractor roads (see Photo 6) if we forget that these cart-ruts are laid in hard limestone. Smaller cart-ruts connect to those main ones. The first thing that comes to mind at the attempt to understand the phenomena of cart-ruts and the reason why they have been created is to look for their possible relations to local temples, which are just as ancient and mysterious creations of ancient people. It seems that since both phenomena are prehistoric there must be some connection between them. Such expectations can seem naïve. In fact «prehistoric time» is an indistinct category. Nevertheless, it really seems that such connection exists. As a rule, if there are temples, somewhere beside there are ruts as well. However, the opposite is not always true. The presence of the ruts does not mean that there are temples nearby. I.e., the correlation is vague. Examples of the former phenomenon are widely known temples: Mnajdra and Ħagar-Qim, and less known: Borg in Nadur, Scorba, Tal-Qadi and Borg L-Imramma and others. Examples of the latter are spots called «Clapham Junction» and Dwejra. In all cases «traces of carts» are completely unconnected to sanctuaries. They do not change their direction when approaching the temples and do not come close to them. Thus, the most natural assumption is that the cart-ruts were somehow used as roads (as peculiar as they were) by ancient people at construction or subsequent use of these very mysterious constructions apparently does not prove to be true. Another assumption that the tracks were created much later by Romans obviously does not have any serious proofs either. 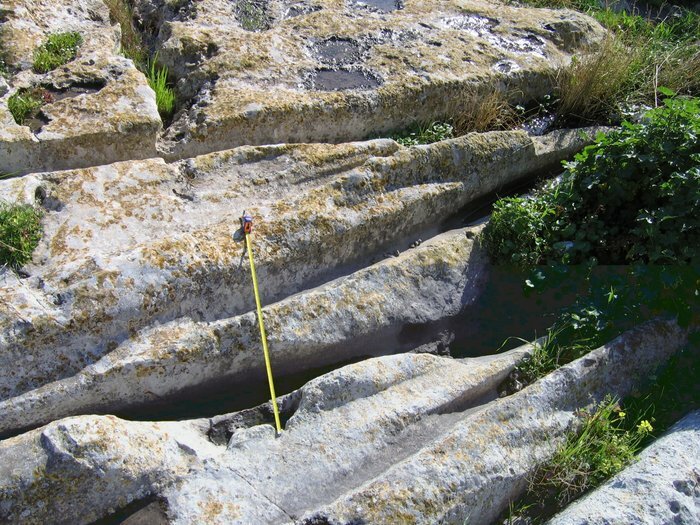 Those rare cases when tracks are connected with ancient Roman quarries, or a well known case when they end at a Punic tomb made in limestone, seem to have a different explanation. These quarries simply happened to be on the way of those cart-ruts. Most of ruts do not have anything to do with these quarries as well as with prehistoric temples. It is clearly seen on the site «Clapham Junction», where a number of cart-ruts go by a few quarries located not far from them but do not interact with them in any way. Since we have started a topic of an origin of the cart-ruts it is important to mention the second popular version, that is the following: the cart-ruts are the result of multiple usage of carts or sledges (drag harrows) that worn out of the surface of limestone. That is, in essence the ruts represent prehistoric rural roads. 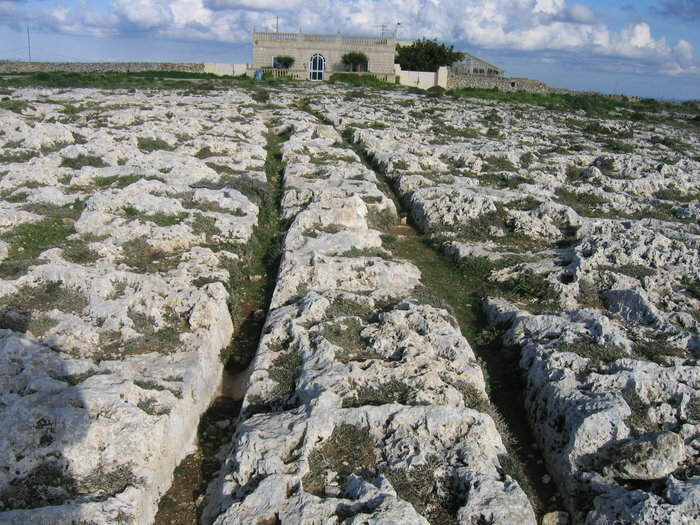 However, it is not clear why on such hard limestone the tracks turned out as narrow, deep and rough trenches. In fact in order to achieve such results it would be necessary year after year, a decade after decade, to follow exactly, up to centimeters, the originally laid way. And, besides, people would always have to use transport with the same distance between wheels or runners. The expediency of such standardization is doubtful in general, and in the Stone Age, in particular. It seems that if these roads were used for thousands of years, it would be more natural to see them wider and smoothly bent on turns. Besides they would be easily traced all the way on the surface of rocky limestone which they cross. However they suddenly disappear in ten or a hundred meters. Why then there are no traces or footpaths from hoofs of animals, which dragged them, between the ruts or on the sides? All of this causes serious doubts in correctness of this hypothesis. There is one more assumption, that the cart-ruts were chiseled in the original base. Supposedly they were made to ease dragging of carts with loads or blocks on skating rolls. This view does not stand any criticism either. Have another look at the photo. Could it be that such labor-consuming work would be done for getting roads of such poor quality? The ruts themselves and mainly their bottoms are not smoother than surrounding surface of the round. I cannot assume that such kind of tracks could anyhow ease the process of movement. But I can imagine the extent of hard labor of people making such ruts being armed only stone instruments. It seems to me that authors of this version are too arrogant towards our ancestors, supposing, that those people in their prehistoric denseness could do such irrational kind of work. If these ancient people were constructing the roads for simplification of transportation of loads, I think, it would be much easier to make an embankment as it was done by people when building roads ever since. However the main argument against the existence of actively used roads on Malta in those days is this: there simply was no need in such roads. For conducting a primitive economy which existed back then (and it is confirmed by archeological excavations) it was sufficient to have footpaths and the opportunity to sail on the sea, which surrounded the land. There are also even more unusual hypotheses. For example, some of them consider cart-ruts as ancient amelioration ditches for removal of extensive water. It is not clear then why it was necessary to dig them in pairs? There is also an opposite version, suggesting that the ruts were a part of the system for gathering condensate waters from the air so necessary in conditions of a dry climate. There are also some absolutely fantastic assumptions suggesting that with the help of the cart-ruts people accumulated terrestrial electricity or space energy. And, sure enough, there is a theory that the cart-ruts were traces of civilizations from other planets. By the way, when looking at photo 9, the last assumption does not seem so unreasonable. From a certain angle it looks like a springboard for taking off, does not it? I mentioned all these ideas not so much for critical analysis, but rather for characterizing a current situation that have developed in the scientific world around the problem of the cart-ruts’ origin. The range of views (including some obviously strange ones) by itself shows that people have not come even close to solving the problem. In fact, even the most moderate and popular versions advocating that the cart-ruts "were hollowed" or "appeared in the process of wearing out of the surface of the ground" are so inconsistent with real data, that they continue to exist and are being discussed only because there are no better explanations. Why did such situation develop? Did it happen by chance or intentionally? I hope that the readers will understand it further. My first acquaintance with the cart-ruts took place in the winter of 2005 during a week-long tourist trip across Malta, a day or two before returning to Russia. There was no special guided tour offered to tourists to see the cart-ruts, therefore I had to search for them by myself. The nearest to St. Julians (where I stayed in a hotel) site was in San Gwann, 15 minutes by the local bus. There, right in the city, on the territory for about hundred meters long fenced with a mesh fence where local people walk there their dogs, I saw something I have been searching for. On a more or less leveled horizontal surface made of hard bright grey limestone, partly filled with dirt and covered by grass I could see pair of deep ruts. First I went to the farthest, northern end of the site where the cart-ruts almost exactly follows the walls of houses and is characterized by consistency of section. All of it looked so even and inexpressive that it did not generate any assumptions. There were no defects or deviations which could prompt any ideas. I felt puzzled. Going back to the south I passed the place where a pair of cart-ruts has divided into two pairs. Further on those two tracks started to approach each other again. It was at the spot where they connected again that I saw something interesting. I do not know about you but after having seen the phenomenon which is represented on the submitted below photos 12 and 13 taken from different points, my assumption has arisen almost immediately. It could not possibly be any hollowing or natural wearing out of the ground. What I saw greatly reminded me traces or prints left in dirt. It looked as if some kind of transport − a cart or a sledge − went deeply into the ground and got slightly stuck there. And all this mess of traces which (at a closer look) consists of three pairs has arisen as a result of the efforts to release the transport from this hole. If one faces the north, one pair of tracks had gone on the left, and two others, having connected, had gone to the right. On their crossing one can see a widening in the middle of a picture. Do not hurry to ask any questions concerning the kind of dirt, its origin, the reason of its hardening, who dragged the transport, and what was in it. We will come back to it later. Just have a look at these and previous photos from the offered point of view, and try to think what in their appearance contradicts the stated assumption. Despite of the ease with which this version was born, its development did not appear to be so easy. This version explained many features of the outward appearance of the cart-ruts. Why so often do they have such uneven width, depth, and structure? Why do pairs of ruts sometimes approach each other very closely, sometimes go in parallel, and sometimes cross each other at an acute angle? Why some tracks are wide and deep, while others are not. Why, at last, they are not connected with temples and quarries? It is all very simple. Nobody hollowed limestone, nobody used it up and worn it out into dust by wheels. Somebody has crossed fresh dirt once and the trace was ready. Hence, there are all the imperfections of the geometry of prints. Nobody has worked on them on purpose. Many things became clear, but at the same time this hypothesis raised a number of serious questions which demanded answers. Otherwise this version risked to become one of the most fantastic assumptions. What kind of dirt it was? Where it appeared from? How to explain its presence at the tops of the highest cliffs of the islands and on the sea shoalness? Why and how has it hardened? When were tracks formed? Did it happen during the last moments of formation of a layer of the deposit or later? What was it that has created them? Why do the tracks from different sites so much differ from each other by form? How were these traces preserved? Why have not they cracked at drying as clay would crack? Why they were not washed out by rains? With all their similarity to prints in dirt, these cart-ruts differ from them in some ways. On their edges there is not a hint of extra dirt which had to be expressed to the sides when something heavy was moving through. Why is it so? Having suggested that the ruts are hardened prints left by some ancient transport that had passed there we find ourselves in the sphere of geological problems. We know that the process of deposit formation and there subsequent changes are a part of the Earth science. Being a geologist and after visiting San Gwann I first of all wanted to learn the existing views on the geology of Malta and Gozo islands. Before leaving Malta I bought a very detailed book called «Limestone isles in a crystal sea» written by Martyn Pedley, Michael Hughes Clarke, and Pauline Galea. 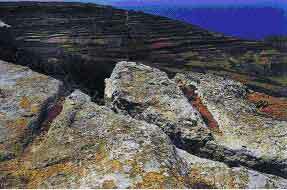 The book was written for amateurs who were interested in the geology of Malta. Further I will be referring to it here and there. In spite of the fact that this is a popular, and not a scientific edition, I think, that main principles and views at the geology of the islands are reflected in the book quite correctly. And this is exactly what we need. So, the main thing that had to be settled in the view of my assumption was the age of the cart-ruts and limestone. The former obviously should be measured by thousands of years, while the latter, according to the above mentioned book, must be measured by millions of years. The problem is that my hypothesis assumes that the traces were formed back in the time when limestone had not hardened yet, i.e. it was in a condition of plastic carbonate silt similar to that which covers the bottom of the sea surrounding Malta nowadays. This means that the age of the ruts should be very close to the age of the rock mass. 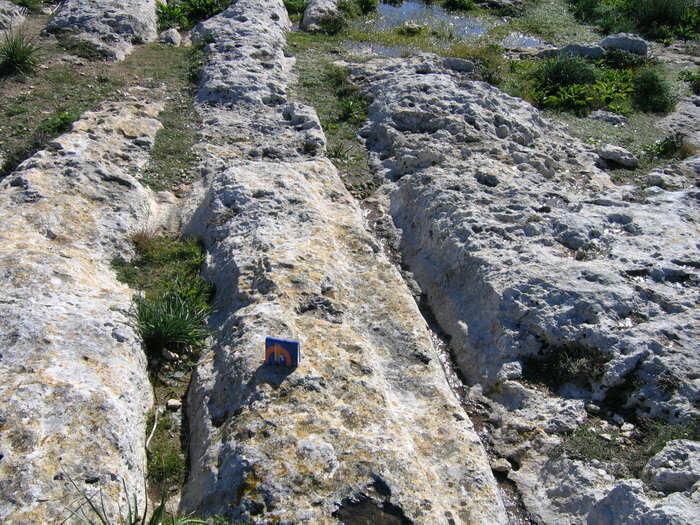 I have already mentioned that the cart-ruts should be basically dated as so-called “coralline limestone”. 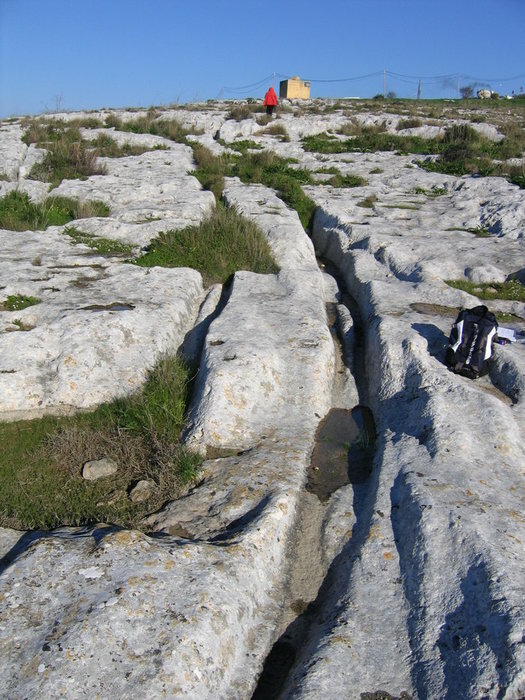 However, the Maltese geologists specify two layers of limestone: upper and lower. It is true that the cart-ruts are found in both, but the age of the former (Miocene) is estimated as 5-7 million years (! ), and the latter (Oligocene) is a bit older − as 25-35 million years (!!!). What should we do? One should either deny my hypothesis or to ignore these data, which have been accepted as dogma by geologists for a number of decades. Or, who knows, maybe, this is one more scandalous refutation of the theory of evolution of Darwin? May be Homo sapiens appeared on the Earth much earlier, than it is now supposed according to the theory? And then cart ruts are the most ancient and obvious verifications of human activity? In fact, nobody doubts that the cart-ruts are traces of human activity, and not an evidence of some forces of nature. However there is another big obstacle to accepting my hypothesis. For some reason "carts" have not developed into something more perfect and continued to leave curved and very uneven traces during 20-30 million years between the formation of lower and upper limestone. Besides, the multi mullion age attributed by geologists to limestone is not the only thing that contradicts my hypothesis. Even if limestone was 5 or 10 thousand years old it would still remain unclear why soft deposits covered hills and plateaus almost on half of Malta and Gozo islands. Had the ruts been distributed 5, 10, 20 meters above the sea level, it would be possible to assume, that the coast rose or the sea level lowed. As a result the coastal shoaliness got drained and covered with sea silt. Then ancient inhabitants for some time dragged back and forth their sledges or carts over that silt. However, tracks can be found everywhere, even on the heights up to 250 meters. Besides they are found not only on horizontal surfaces, but also on slopes. 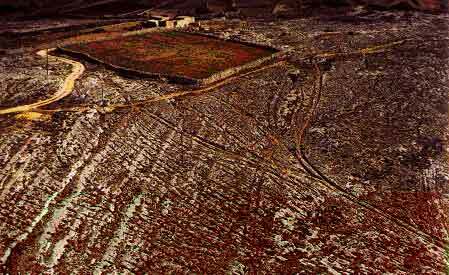 Could it be that whole Malta rose out of the sea depths being covered with silt? But why then such deposits did not cover it everywhere? In general, there are lots of serious problems. I had to search for the answer not being near the cart-ruts on Malta, but at home in Russia. I can guess that a similar idea that the tracks are prints of some transport occurred to people earlier. The fact is that they have very characteristic looks. But it seems that such ideas were given up before being developed since nobody managed to coordinate them with the geological history of islands, or … dared to deny that “history”. It was difficult to believe that tens of geologists during more than for a hundred years of geological studying of the islands could be so seriously mistaken. Nevertheless I was confident that the tracks were load-casts of something. So, it was necessary to understand in what points the previous researchers were mistaken and made essentially incorrect conclusions. How to coordinate an available actual data with my new conception? My twenty years' experience of works and knowledge of the standard answers in classical geology to typical situations (patterns) helped me a great deal. Further I will arrange this article in the following way. First I will shortly state my understanding of the most important latest stages of geological development of the islands and their consequences. I will include minimum arguments understandable only for specialists since I think that the main argument pro an offered version is the interrelation of causes and effects stated below. 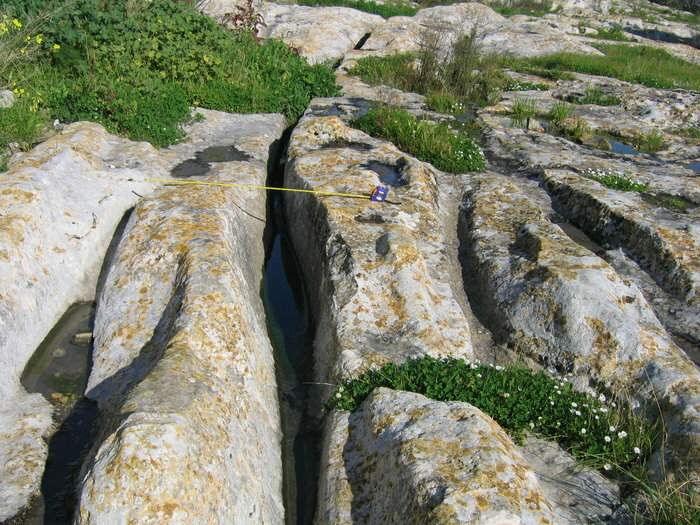 For professional geologists and geomorphologists I will try to reveal my position more precisely only on the key points of geological structure and history of Malta. For those who will understand the logic of the events, the submitted information will probably be sufficient in order to agree with the suggested concept.